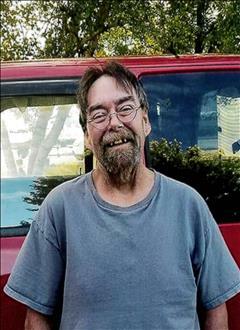 Rodney E. Johnson, 57, of Badger passed away Monday, February 4, 2019 at Mercy Medical Center in Des Moines. A visitation will be 4:00 to 7:00 pm Friday, February 8, 2019 at Badger Lutheran Church with a Celebration of Life beginning at 7:00 pm at the church with Rev. Scott Meier officiating. Laufersweiler-Sievers Funeral Home is serving the family. Rod was born in Cedar Rapids, Iowa to Barbara (Guilliams) and Larry Johnson. He was educated at the Moor School in Des Moines. Growing up, Rod loved spending summers at his grandpa's farm, fishing and spending time outdoors. On September 13, 1980, he was united in marriage to Julie Cote. The couple later divorced. He grew to love driving semi's especially, when he drove for Carson and Barns Circus. He liked the carefree, "gypsy" lifestyle. The last several years he lived in Badger. Rod worked for many clients mowing and maintaining their yards. In Badger he found his place at the church and developed a beautiful relationship with God. Rod was a great friend and he loved spending time with his grandchildren. Rod is survived by his sons, James (Natasha) Johnson of Badger; Rodney Jr.; grandchildren, Nathan; Jezika; Kadence; Rylie; Emerie; and one on the way; mother, Barbara King of Johnston; step-mom, Lois Johnson of Manson; "little" brother, Tracy Johnson (Teresa) of Missouri; step-sister, Cheryl (Robert) Danner of Idaho; step-brother, Ricky Winters of Manson; and he leaves behind many very good friends, whom he cherished. Memorials may be left to the family's discretion. "You will be miss young man, lots of memories to be remembered . love you sister Cheryl and Bob Danner"
"So sorry for your loss James. Thoughts and prayers go out to you and the family. Sandy L. "
"RIP Rod you will be missed by so many people"